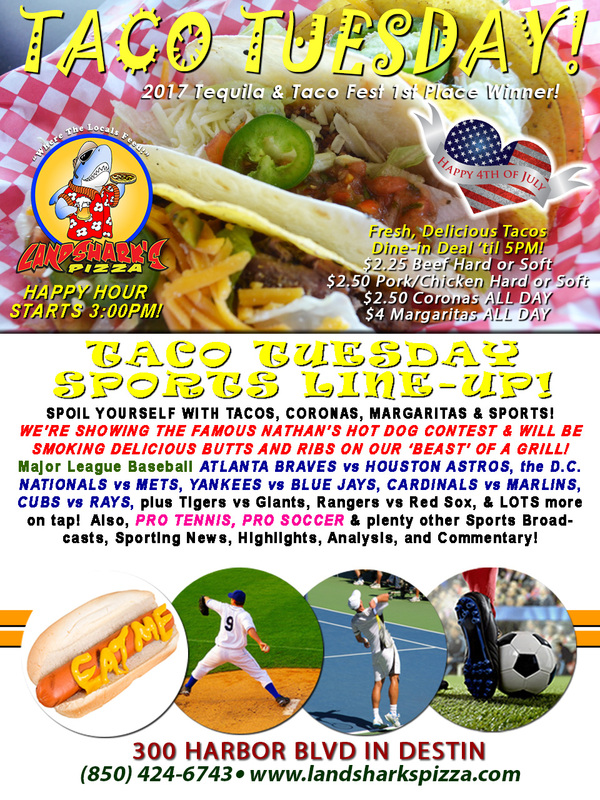 / Best Taco in Destin FL / JULY 4th TACO TUESDAY – BUTTS WILL BE SMOKED & EATEN, Ribs too! MLB, WIMBLEDON & NATHAN’S HOT DOG CONTEST! JULY 4th TACO TUESDAY – BUTTS WILL BE SMOKED & EATEN, Ribs too! 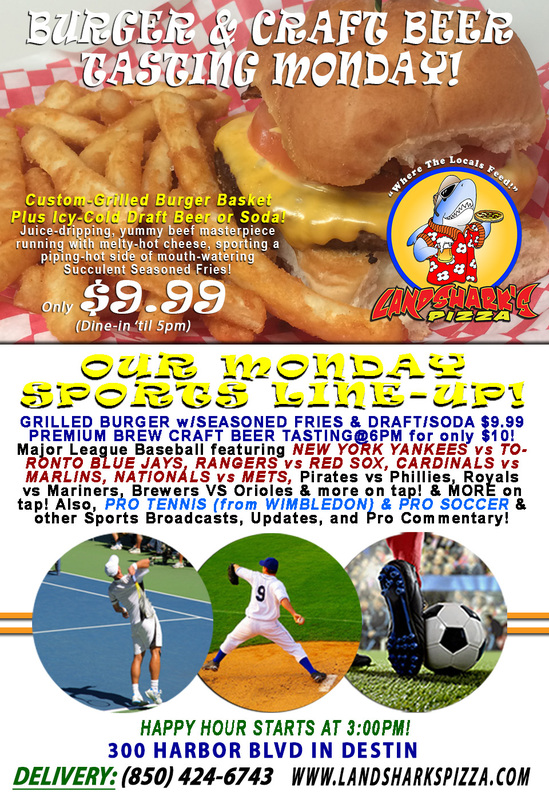 MLB, WIMBLEDON & NATHAN’S HOT DOG CONTEST! There’ll be lots of 4th of July Sports (including WIMBLEDON & The Nathan’s Famous Contest on the back deck where the grillin’ will be going down) – Also, eat like a king today with Award-Winning Tacos that took 1ST PLACE at the 2017 Taco & Tequila Fest! Our TACO TUESDAY SPECIALS: $2.25 BEEF, $2.50 PORK OR CHICKEN (dine-in ’til 5pm with regular drink purchase). Also featuring $2.50 Coronas & $4 House Margaritas go all day long! No Rock’n Bingo today – everybody’s gonna be too busy eating and drinking to sing properly (except in our own imagination). HOT SPORTS ON OUR ARMY OF BIG SCREENS – CHOW-DOWN ACTION with THE 2017 NATHAN’S FAMOUS HOT DOG EATING CONTEST! 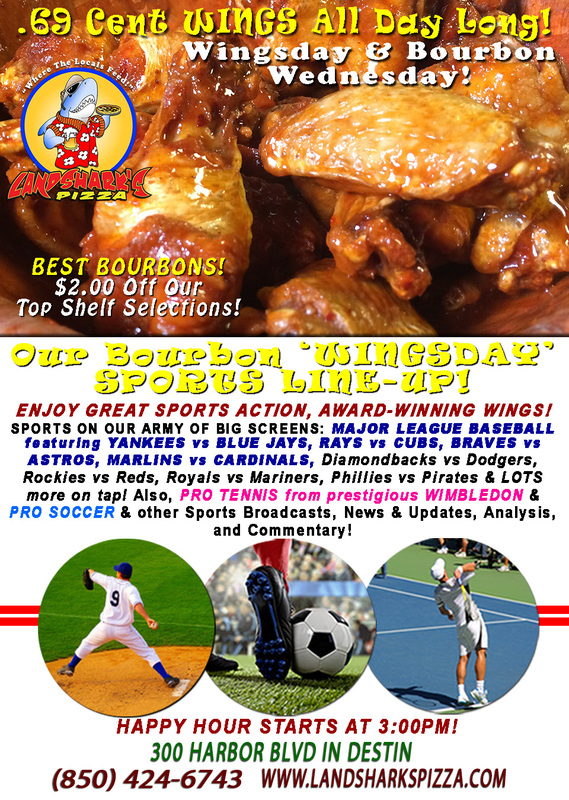 Major League Baseball BRAVES vs ASTROS, NATIONALS vs METS, YANKEES vs BLUE JAYS, CARDINALS vs MARLINS, CUBS vs RAYS, Tigers vs Giants, Rangers vs Red Sox & LOTS more on tap! Also, PRO TENNIS from WIMBLEDON and PRO SOCCER & plenty other Sports Broadcasts, Updates, Analysis, and Commentary by old dudes who don’t play anymore! PGA Golf This Week: The Greenbrier Classic@The Greenbrier, WV (7.1 Million on the line). Pro Tennis This Week: 2017 Wimbledon (Endland) July 3rd through 16th. NASCAR This Week: (Thurs Jul 6th) Camping World Trucks Buckle-Up in Your Truck 225! (Fri Jul 7th) XFINITY Alsco 300. (Sat Jul 8th) Monster Energy Quaker State 400 – All three@Kentucky Speedway. DON’T FORGET TO CALL LANDSHARK’S FOR ALL YOUR EVENT CATERING NEEDS! Previous Post: « Warm up For the 4th on BURGER & CRAFT BEER Monday $9.99 Burger Basket & Draft or Soda|CRAFT BEER TASTING@6PM!